If you guys also want to crush your competitors and harness Google's new changes to your advantage, grab this and grab it quick. Awesome value once again. Thanks guys! Stop Clinging to Out-Dated Methods And Failing Tricks! … What does Google really want? … How does Google rank sites in the new value based economy? I've identified The Seven Ranking Signals Google is now using to rank websites. ==> They're unable to deliver results, because their tactics are obsolete... and it's putting them out of business! Google's sole aim is to become The World's Best Search Engine. It wants to provide the best possible user experience. It determines how well a website provides that user experience, by using it's famed (and occasionally frustrating!) algorithm. And they discard the sites still trying to artificially manipulate their rankings, instead of providing value. 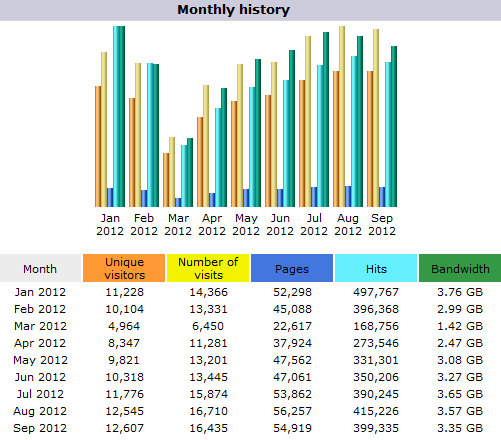 5 Figure Monthly Traffic... No Link-Building Whatsoever! 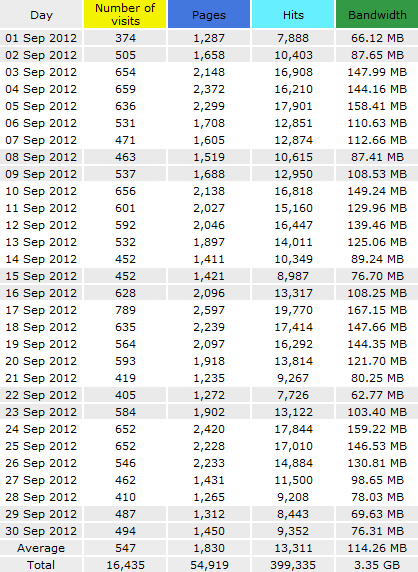 The traffic stats above are taken from a website currently ranking #1 for it's main keyword. This site has never conducted a link-building campaign, nor does it have any natural backlinks! Backlinks are still important, but ONLY as part of the bigger picture. And while this site isn't a typical result in terms of traffic, it proves to show that backlinks are not important as the mainstream will tell you. In fact... building your links the old way will sink your site faster than the Titanic! Average 547 Visitors Per Day... A Value Focused Approach! Signal Pigeon is a detailed video presentation exploring each ranking signal, in a way that makes sense, and can be applied to your business. I've also included a 'Ranking Signal Checklist' so you know exactly where to focus your efforts next, and ensure you've covered All Seven Ranking Factors. The Single Rule To Follow that'll help you gain better rankings as you grow your business... Understanding this rule will help you succeed today, and survive through future updates tomorrow. The Biggest Mistake Marketers are still making when creating their site content... This not only wastes your time, but can actually get you penalized by Google in the process. The Real Deal Behind Post Penguin Backlinksand what Google looks at in your backlink profile in 2012... This will get clear up any 'backlink confusion' you may have, and leave you with a simple plan to follow, to leverage within your traffic campaigns. A No-Nonsense Approach To On-Page SEOand how to develop a truly Google-Friendly site, while avoiding the 'over-optimization' so many others fall prey to... This strategy directly improves several other ranking factors to enhance your ranking potential even further. Discover The Least Talked About Ranking Signal in place today, and the one which is becoming more and more important as time goes by... Apply this to your business now and surpass any competitors who ignore it and get left behind. Reveal The Most Influential Factor in modern day site ranking, which determined whether a site survived the Panda update, or got discarded to the back pages... Put your focus on this and you'll not only achieve higher rankings, but a more profitable business overall. A Detailed Checklist Of Each Ranking Signal with a description of exactly what Google looks for... Use this as an easily accessible reference point to determine what you need to focus on next to achieve your front page rankings. Just purchased this, I'm 11 minutes into the video and it is clear this guy knows what he is talking about!! I've already learnt a lot in such a short space of time. I've just taken a break half way through the video. So far it's good stuff, a mixture of evergreen info that works (and always has done but is very rarely taught) plus the effects of the latest changes to the Google algorithm which others are (or were!) keeping to themselves. I was an SEO professional for 10 years before retiring two years ago, I bought this to "catch up". The mindmap + Video is at the same time simple but comprehensive. I already have more than I expected for the price, now I'm off to finish it. Thanks for releasing this to the Warrior world Chris. Bought this today - excellent advice and he talks fluently without any eh, ehm - what a relief lol! because there's a lot to get through. Really knows what he's talking about. This is an awesome SEO training course and very different to most I've seen. Some of the content in here is hardly talked about this way if at all. I believe it was a mega steal at $7 and it opens up a lot of opportunities. I wasn't hit by any of the recent updates but some of my sites and clients' sites are stuck. I can see how a few pointers in this WSO can propel those sites up wards. This maybe the missing link to give them the extra nudge to the top. 2 reviews. You are the second, i bought this, and was floored. This is so good, i am going to send it to my people. When I purchased this WSO I wanted to get good understanding of how Google behaves. Now I know exactly what Google is all about. When you understand this you can leave all the dumb things you've done before, which do not work or even do a lot of harm. This is good lesson if you want to make your website be found naturally by people in Google. Thanks and best regards from Poland. You have just verified some things I suspected, and added several things I hadn't thought of at all. Very well done information that I plan to go over again and again to remind myself of the things I need to do daily. The hard part is going to be creating a new, better website that truly outshines other similar websites. In a world full of very smart people this can be tough to do. But your info verifies my suspicion that it is now a necessary task to be done. Your info is very very nicely presented and I appreciated that you didn't break the info up into separate OTO's designed to get over a hundred bones outta me! This is real info folks, not a bait and switch. I would reccomend (and plan to) this info to any website or blog owner. As a review for the information in the original WSO - the content is useful, comprehensive and puts everything in one place. For the price of $7- $10 which will hardly break the bank and provides a great overview for those who don;t really understand how search engines and rankings come about. For people a little further along the learning curve the information is a great refresher and triggers the mind to further thought on how to improve. It's good to see everything all in one place and explained so well. Thanks again. It was well worth the money. I've purchased a lot of WSO's over the past 12 months but this is one of very few that actually delivered what they promised to deliver. The information is golden for anyone with text based content on their website. Since I have an image based site, I'm finding it a little challenging to properly optimize it, but I got some very useful tips from Munch. I believe this should be 'standard reading' for any online entrepreneur doing business in the modern era. So I've condensed the best of my 7 Years collective SEO Knowledge into this single video presentation... All killer, no filler! Hit The Buy Button Now and once the secure payment has been made, you'll be taken directly to download your copy of Signal Pigeon. After you buy... you'll be wise to what Google wants, and what you need to focus on next to get your site on to the front page. So if you don't think this information is worth the investment, or ten times the investment... just get in touch and I'll refund you in full, no questions asked. Thank you for hearing me out. This information is essential to any future success you desire when working with Google. Click The Buy Button Below to get the inside scoop on what Google really wants, and actually rewards in 2012... to surpass anyone who refuses to evolve, adapt and thrive in the new value economy. Having each of these covered within your business will guarantee your advantage over competitors who do not. I've backed this information with my Iron-Clad Guarantee, so rest assured you will not lose out if you don't find this information at least ten times the value of what you invested. Hit The Buy Button above or below to ensure your success in the Google's new value economy. You're doing yourself and your business a disservice by ignoring what you've read on this page. The business climate is changing day by day, and businesses that do not produce these Ranking Signals will lose out to the businesses that do. The sooner you start producing these signals, the more difficult it will be for any competitor to rank higher than you. The longer you leave it, the more vulnerable your site becomes. Hit The Buy Button Now to take back the upper hand. Q: I Can't Get Access or Need Help? Please don't post your support query in the thread. It is very difficult for us to keep up with the thread, and identify customers who need support. The thread is for pre-sales questions and reviews. If you need help please send me a support ticket. A: The video is about 90 minutes and gives you vital actionable information that you can use in your business. How this information applies specifically to your business and what changes you may make in your marketing plan is unique to you. Experienced Search Engine marketers will already have a good understanding of what is in the video, but will likely discover something new that they had not considered previously. 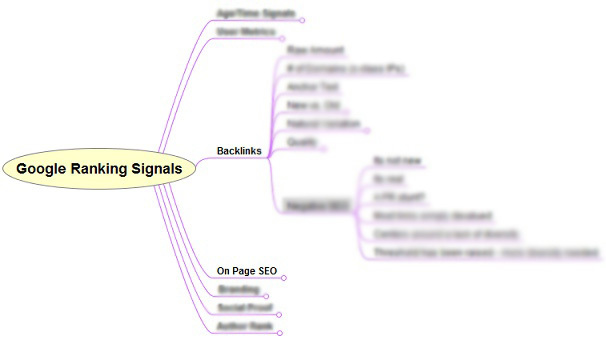 A mind-map is a available to all buyers so you can see a summary of the information. A: Yes there are two customer offers . The first is never before seen inbound marketing software to drive traffic to your site. It helps build social proof, develop your brand, create author-rank, and the right type of traffic sending links. The second customer offer is for software which monitors your website to ensure it is loading for users and is fast. The prices of the customer offers are highly discounted and revealed after you buy as they are special deals put together for Signal Pigeon customers. 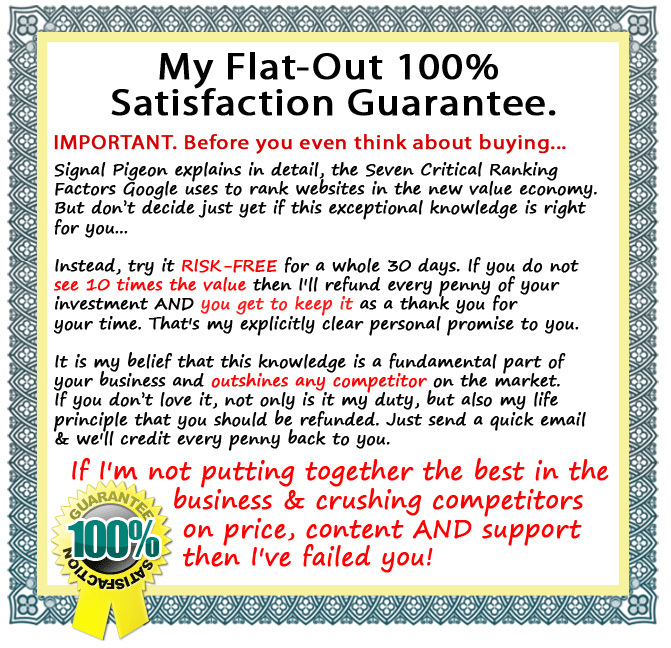 The customer offers are not linked to Signal Pigeon report or necessary in any way to make Signal Pigeon work better. Its just a great complementary option if you want to use software to help manage and grow your business. All customer offers are completely optional. A: Ultimately any results are down to you and how you apply the information. After going through Signal Pigeon you'll have a much better understanding of the big picture, the Google algorithm and it will all fall in to place, as to why your sites do or don't rank highly. This will also give you the true knowledge to analyze why your competitors are out-ranking you. You can use this information to improve the ROI of your marketing campaigns and to strategically move your site higher in Google. The information in Signal Pigeon is applicable to any niche, wherever you want to get more Google traffic. Thanks for the great testimonials! Its smart SEO - and a must buy to future proof your future site rankings. This is incredible. Laid out very well and easy to understand. One word describes this: Wicked! I haven't seen anyone describe these signals this clearly, until now. Bravo Chris! Chris, I trust your training and your products. Always quality. Always designed to get results. Quite an accolade when you've got Bertus praising the product on the forum. He also has great products. I'm really excited about getting your tips included on my numerous domains and seeing them soar up the rankings. Glad I was in early. Many thanks Chris. Note how many devotees you've got from the UK!! Thanks for keeping us ahead. Damn Google to HELL!! If it wasn't for people like Chris Munch and awesome, up to date WSOs like this one, we would all have been lost. Thanks for bringing us up to speed.